A few weeks ago, we bottled about 3,400 cases across 11 different wines. Among these wines were some old favorites, like the Estate Roussanne, Estate Viognier, and Château Duplantier, but also some new exciting wines. We are especially thrilled about two new takes on some old favorites in our white Rhône program, both of which will be available only to club members. The first is our Reserve Viognier. 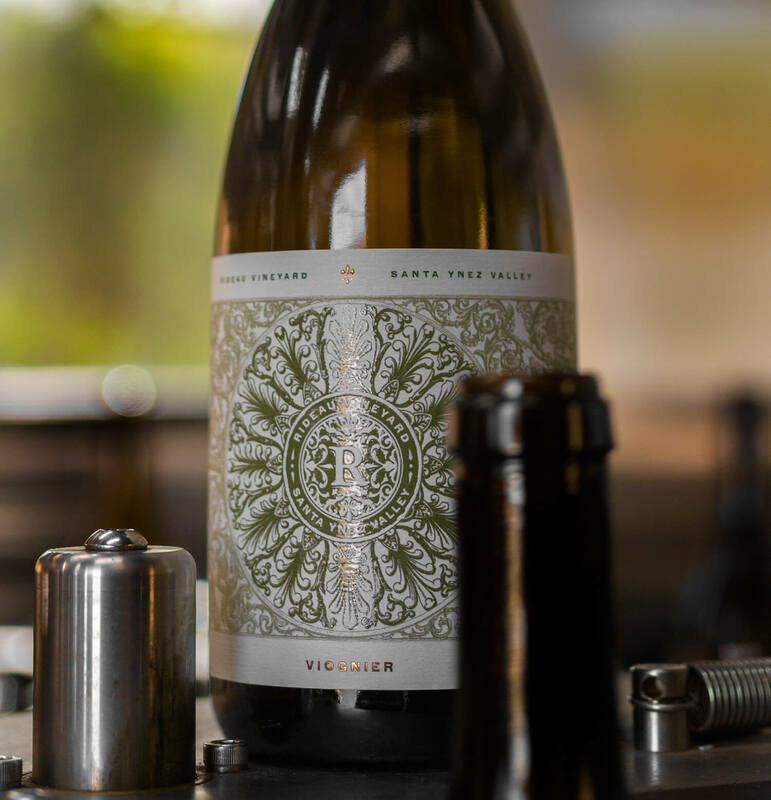 We are well known for our Stainless Steel Estate Viognier, but over the past few years, our winemaker Adrienne and assistant winemaker Gretchen have been incorporating small amounts of oak influence for certain bottlings to explore the versatility of this grape and the range of palates that visit our tasting room. By taking advantage of the micro-oxygenation that happens through the pores of barrels, we have been able to showcase the fleshy tropical fruit notes along with fresh honey and a bit of creaminess. This year, we also included some skin contact on a small portion to see if we could bring out even more of those hidden characters. Just like in red grapes, there are flavors in the skins of white grapes, but we don’t always take advantage of them because we send those grapes straight to press and separate the juice. 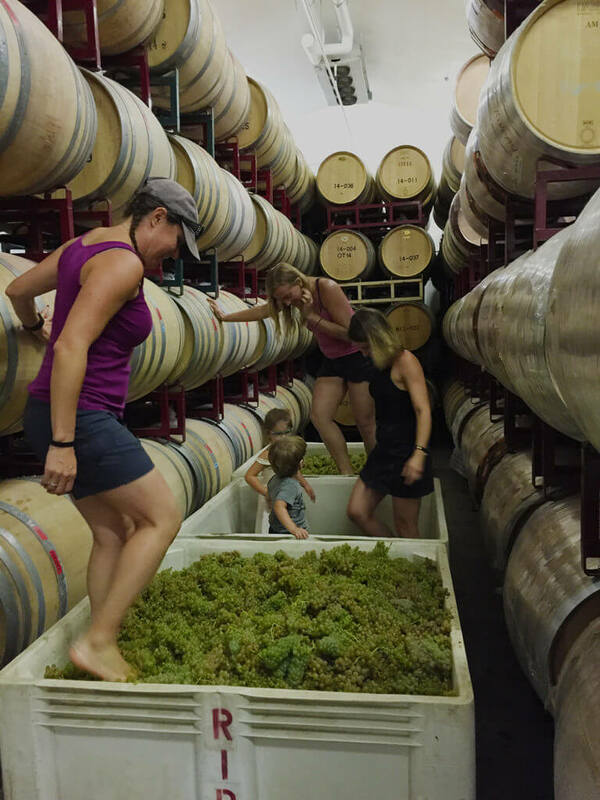 This year, Gretchen and Adrienne, with the help of Isabelle, Adele, and Arthur, stomped a few tons of Viognier to make sure that all the berries were crushed while taking extra care not to crack the bitter seeds. We left them in the bins to extract flavors and aromatics from the skins and stems for 24 hours before pressing them off and allowing them to ferment and age in neutral oak barrels. WOW! Every day during fermentation the winemaking team tasted everything, and they were always excited to see what these wines had in store. As one would expect, we found warmed pear, peaches, mango, pineapple, even mai tai, but in addition to that, we found amazing clove and baking spice notes. This quickly became a favorite and we realized we had to keep it separate and reserved from the rest of the Viognier! Keeping with the theme of skin contact white wines, we also bottled a small amount of our Zaca Mesa-sourced Roussanne that was fermented like a red wine entirely on its skins. Cuvée Dorée (translated roughly as “gilded blend”) is a beautiful golden-hued wine full of rose water and orange peel aromatics. We always call Roussanne our “white wine for red wine drinkers” because it has great mouth feel and tannin structure and is ageable, but adding skin fermentation into the mix brings it to another textural level. Once again, we were awestruck by the uniqueness of this wine. The bronzed skins of the Roussanne were full of spice that we don’t often associate with white wines; the waxy notes we typically find as “honeycomb” in the finished wines became more distinguished as orange oil and coconut. We bottled a very small amount of this unique wine which, as with the Reserve Viognier, will be allocated strictly to our club members. Even though we bottled mostly white wines in July, we also bottled our winemakers’ favorite estate red: Grenache! Grenache is the Pinot Noir of the Rhône family. Typically a lighter wine, it is still amazingly full of flavors and aromatics and pairs with everything from fish to red meat. Our Estate Grenache is full of raspberry jam, violets, nutmeg, hints of cocoa, and so much more. Often pre-judged by its lighter hue, people are shocked with how much flavor it has, and the structure and tannin that allow the wine to linger on your palate. This 2015 Grenache promises to be one of our best vintage so far. I remember as a kid being told that we had to stop eating all the grapes or there wouldn’t be enough left to make wine. While my love is Rhône wines, there will always be a special place in my heart for Cabernet Sauvignon as it brings back amazing memories of my childhood. My brother and I would spend hours and hours (which we are now told was about 10 minutes at a time) playing in the vineyard, and smelling the Cabernet fermentations fill the cellar. We sourced our fruit from Happy Canyon Vineyard and bottled it under our new Adobe Series label as a vineyard-designate wine. Look out for its release, as the small amount we bottled won’t last long based on the response we’ve received from early tastings. In addition to these exciting new wines, we also bottled our iconic Château Duplantier, easily one of the most popular red wines here at Rideau Vineyard. It came off the line just in time, as we’re nearly sold out of the 2014 bottling, so look for it to debut in the coming two months. This 2015 vintage has all the hallmark characteristics that we all love in the Château, showing classic Rhône elements bolstered by the sturdy Petite Sirah grape, but this year seems even more concentrated and rich than previous vintages. We won’t be able to describe in the depth all the other wines from our July bottling, but you’ll be hearing about them as they roll out over the coming months. Okay. One more. We can’t resist mentioning Enchêvetré (meaning “entangled”), our new Rhône white blend of four varietals, all beautifully integrated, both bright and luscious on the palate with great acid and structure. We’re obviously excited about these wines and we’ll take any opportunity we can find to talk about them! We’ll be doing so in the coming months through our website and blog, but in our tasting room as well… there’s no better moment to talk about a wine than when it’s fresh on your palate.